Mataks futsal club become the SIPA Futsal Challenge champions for the first time after a 7-1 win against Kooline in the final today at the Multi-purpose Hall. 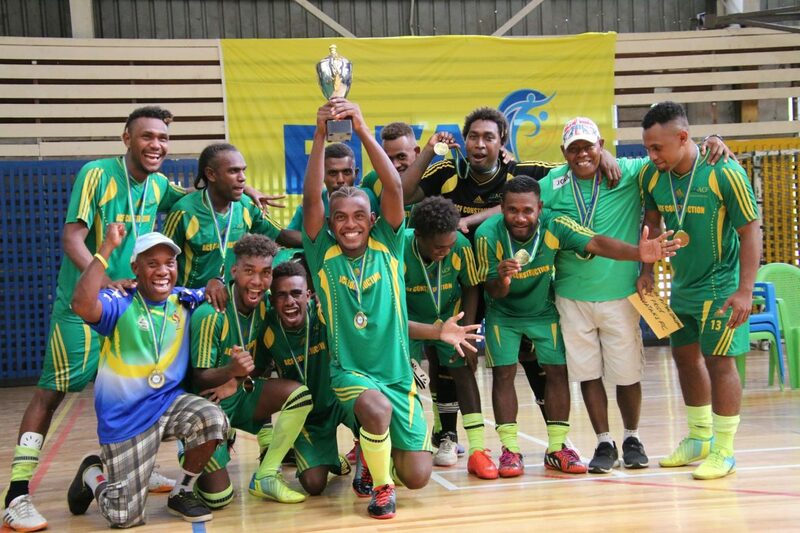 Led by former Solomon Islands international Francis Lafai, the young lads from Matariu community defies the status quo in the local futsal scene to overcome a much fancied Kooline side which consist of mostly national futsal players. Two goals from Marlon Sia and a lone goal by Sammy Laui saw Mataks leading 3-0 at the break. Kurukuru forward Sia completed his hat-trick in the second half and went on to grab a fourth alongside a brace from George Gwai to round up a convincing grand final victory for Mataks. Kooline captain Coleman Makau’s goal in the second half was not enough to stop the Mataks onslaught in the final. Mataks player coach Francis Lafai gave credit to his young team for a historic win against an experience side. “First I want to thank God for this victory and credit to the young boys for this historic win”, he said. “These boys are very young but they have had stick to our plan throughout the tournament so I am very pleased with their overall performances. “We made history when we won the semi-final because we always went out in the semi. “And to win the final was a fulfilment of what we have been dreaming of for a very, very long time”. Earlier in the day Solympics had beaten Koloale with the same score margin as the final. Wonder boy Raphael Lea’i made his return with four goals to his name in the first half. Leon Kofana, Calwin Do’oro and Ronado Cromwell scored a goal apiece while Junior Wane notched in Koloale’s only goal also in the first half. The second half finished without a goal for either team to hand Solympics a 7-1 victory over a much improved Koloale side. The official presentation was held after the finals at the Multi-purpose Hall for both league and the SIPA Futsal Challenge.